Congenital triangular alopecia (CTA, also known as temporal triangular alopecia, Brauer nevus or hypotrichotic nevus) is a localized, nonscarring form of alopecia typically affecting the frontotemporal region and less commonly the temporoparietal scalp. Very few cases of CTA are reported on the occipital scalp. CTA can develop at birth or later in childhood as a triangular, oval- or lancet-shaped, nonprogressive patch of alopecia. We report a case of 2-year-old child who presented with a single patch of hair loss over the occiput since birth. A 2-year-old male child presented with a single fixed area of hair loss over the occipital scalp, which was present since birth. It was asymptomatic and nonprogressive in nature. The parents gave a history of topical application of some ayurvedic indigenous medication a week back which was followed by redness over the lesion and surrounding area. There was no history of absence of skin over the patch at birth. 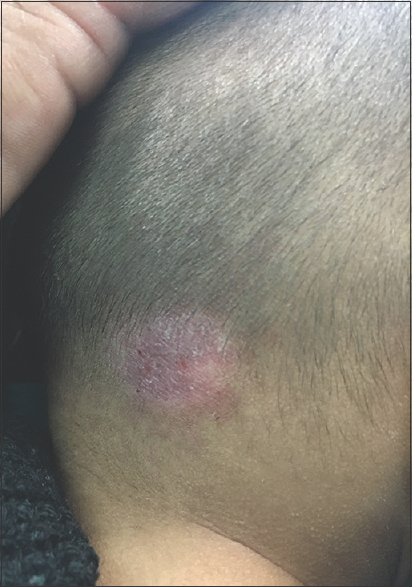 On examination, a single lancet-shaped 3 cm × 2 cm patch of nonscarring alopecia was present over occipital scalp [Figure 1]. Erythema and scaling were noted over the patch. Few vellus hairs were also present within the patch. There were no exclamation mark hairs. Trichoscopy could not be performed as child was very irritable. The presence of the lesion since birth, relative fixity of the size, shape of the lesion without any exclamation mark hairs led to a clinical diagnosis of CTA. The parents were counseled regarding the poor chances of hair growth with any topical treatment and to consider hair transplantation when the child grows. As already stated, CTA usually affects the frontotemporal, or less commonly the temporoparietal scalp. However, about 2.5% of cases present with the area of alopecia overlying the occipital scalp. Although termed as “congenital,” CTA usually manifests after the age of 2–3 years or later as the surrounding nonaffected vellus hair are gradually replaced by terminal hair. The condition appears to be quite rare, and since the first description of CTA in 1905, only 128 cases of this entity have been reported in literature till now.,, To the best of the authors' search, only two cases of occipital CTA have been reported in literature [Table 1].,, However, this “rarity” of the disorder has been questioned earlier as well  and certainly may be due to relative lack of awareness. The diagnosis of CTA remains essentially clinical, depending on its location, appearance, and stability of the alopecia. More recently, trichoscopy (using a dermatoscope) has proved to be a useful diagnostic tool to clinically rule out the more common differentials such as alopecia areata, tinea capitis, trichotillomania, and traction alopecia. Furthermore, Karadag Köse and Güleç identified trichoscopic follicular features of short vellus hairs, vellus hair length diversity and white hairs in all their nine CTA patients. Histopathological examination, though not essential to diagnosis, shows unremarkable epidermis and dermis without any inflammatory infiltrate. Hair follicles are normal in number but miniaturized with increase in vellus or indeterminate hairs. Sweat and sebaceous glands show no abnormality. Common differential diagnoses, with differentiating features are described in [Table 2]. Thus, we present this case to bring the focus to this uncommonly diagnosed and probably underreported disease and to differentiate it from other causes of nonscarring alopecia by its unique presentation and stable course. This can avoid injudicious treatment attempts thus minimizing the treatment-related adverse effects. The authors certify that they have obtained all appropriate patient consent forms. In the form, the patient's parents had given their consent for images and other clinical information to be reported in the journal. They understand that names and initials of the patient will not be published and due efforts will be made to conceal patient's identity, but anonymity cannot be guaranteed. Dey VK, Bhadoria TS, Saxena A, Jaisinghani AK, Patil AY, Dubey N, et al. Congenital triangular alopecia: The 127(th) case. Int J Trichology 2016;8:50-1. Bonifazi E. Hypotrichotic nevus (congenital triangular alopecia). Eur J Pediatr Dermatol 2011;21:57. Jamwal A, Sharma SD. Congenital triangular alopecia. Indian Pediatr 2014;51:511. Muller SA. Alopecia: Syndromes of genetic significance. J Invest Dermatol 1973;60:475-92. Karadaǧ Köse Ö, Güleç AT. 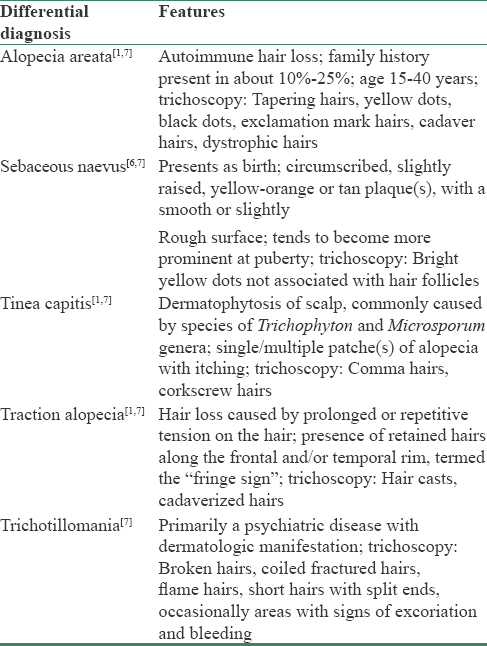 Temporal triangular alopecia: Significance of trichoscopy in differential diagnosis. J Eur Acad Dermatol Venereol 2015;29:1621-5. Trakimas C, Sperling LC, Skelton HG 3rd, Smith KJ, Buker JL. Clinical and histologic findings in temporal triangular alopecia. J Am Acad Dermatol 1994;31:205-9. Bang CY, Byun JW, Kang MJ, Yang BH, Song HJ, Shin J, et al. Successful treatment of temporal triangular alopecia with topical minoxidil. Ann Dermatol 2013;25:387-8. Chung J, Sim JH, Gye J, Namkoong S, Hong SP, Kim MH, et al. Successful hair transplantation for treatment of acquired temporal triangular alopecia. Dermatol Surg 2012;38:1404-6.